Haigood & Campbell was founded by A.O. “Bully” Campbell and Cecil Haigood in 1947 after returning from World War II. From its humble beginning with just one truck located in Archer City, Texas, Haigood & Campbell now operates a fleet of bobtails and transports serving the Greater North Texas area and beyond. Now in its second generation of family ownership, Haigood & Campbell handles every fuel and lubricant need for commercial, residential, agricultural, and industrial use. We know you can get your fuel from anyone, and so our service promise is what has kept some of our customers continuing to call us for the last half a century. Give us a call today and we would surely appreciate the opportunity to earn your business for many years to come! 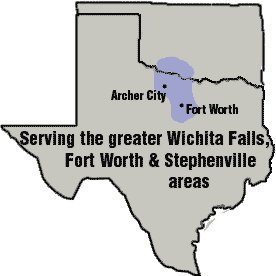 Go here to view our Propane Service Area and Fuel Service Area. I wanted to take a moment and say thank you for the continued excellent and friendly service we receive each week from your company. Your driver is always prompt and very courteous, asks how we are doing and if we need anything. It is all greatly appreciated! Many thanks! I would just like to say thanks . . . in my 18 years of Management I have never seen a driver so dedicated to his profession and very well educated and polite as he is. Your driver is always concerned about the customer service that your company offers, and he is always helpful making sure that we are completely satisfied.